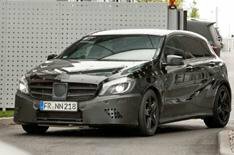 Mercedes A45 AMG unveiled | What Car? The new Mercedes-Benz A45 AMG will have the highest bhp-per-litre figure of any four-cylinder engine when it goes on sale next spring, according to AMG bosses. The A45 AMG will top the new A-Class range, and will have a 2.0-litre turbocharged engine with 295lb ft of torque. There's no official power figure yet, but it's expected to be around 325bhp. Four-wheel drive and a seven-speed twin-clutch transmission are standard. Performance figure are yet to be released, but we'd expect a 0-60mph time of less than five seconds. Mercedes says it is aiming for 'class-leading' CO2 emissions and fuel economy, thanks to the comparatively small engine capacity, and energy-saving features such as an engine stop-start system. To cope with the power, there are extensive chassis modifications and upgraded brakes. Although it will become AMG's entry-level model, the brand says the A45 will have 'as much technical investment' as its more expensive models. At an exclusive preview, we had a look at a production model. Visual changes over the A250 Sport model which has AMG styling features are subtle, but there are bespoke 'silver shadow' bumper and side-sill inserts, 19-inch alloy wheels and 'Turbo AMG' badges on the front wings. As well as sportier interior trim, the A45 AMG will be available with new AMG performance seats, which have been co-developed with Recaro. These will also become available for other AMG models. Prices are yet to be confirmed, but we'd expect the A45 AMG will cost around 32,000 when it goes on sale next spring.